Now that my husband plays in an Irish rock band, how could I not make something Irish at this time of year? After all, St. Patrick's Day is Sunday. I tend to gravitate towards "pub grub". It's comforting and always goes perfectly with a pint. So when I saw locally-made bangers (aka sausage), well I couldn't resist buying them. Fun fact (a la Wikipedia): Although it is sometimes stated that the term "bangers" has its origins in World War II, the term was actually in use at least as far back as 1919. The term "bangers" is attributed to the fact that sausages, particularly the kind made during World War II under rationing, were made with water so they were more likely to explode under high heat if not cooked carefully. And what goes better with bangers than mash! Now, you know, I can't just make a traditional version of anything. I had to put my own spin on things without being too sacrilegious. Thus, I decided to roast the bangers instead of frying them and I replaced the traditional mashed potatoes with mashed sweet potatoes. The result was pretty darn good and still a nice match for a pint of stout. Add the sweet potatoes pieces to a large pot and fill with water. Enough to fully cover the potatoes. Put the pot on the stove over medium high heat. Bring it all up to a boil and cook for 15-20 minutes, until the potatoes chunks are fork tender. Drain and transfer to a large bowl. Mash with 2 Tablespoons of olive oil. Season with salt and pepper. Cover and set aside. Place the bangers on a rimmed baking sheet lined with foil. Roast in oven for 20 minutes, flipping over the bangers halfway through cooking. Heat 1 Tablespoon of olive oil in a small frying pan over medium heat. Add the chopped onions and saute until soft and translucent, about ten minutes. Stir in broth and cook until thickened and reduced by half. Remove onions from heat and whisk in Dijon mustard. Season to taste with salt and pepper. 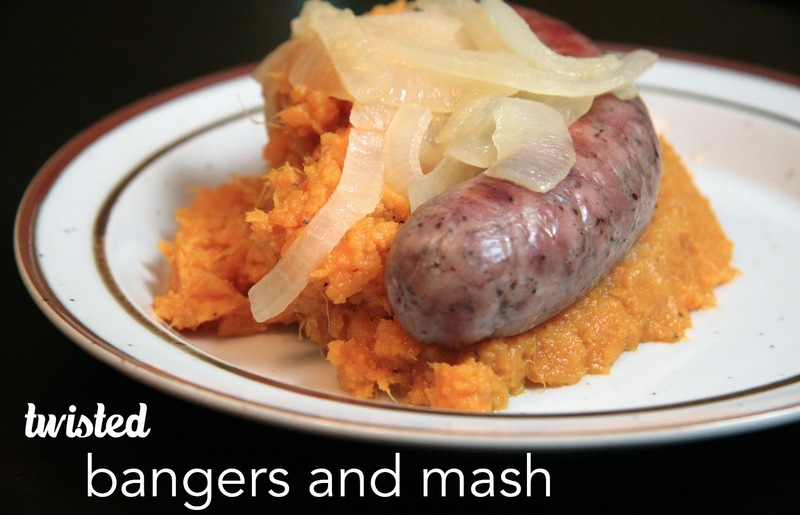 Serve the bangers over the mashed sweet potatoes, topped with the onion gravy.